Earnings Blowout - What Does It Mean? What is the definition of an "earnings blowout?" What constitutes "blowing out earnings"? 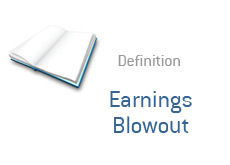 Simply put - an earnings blowout occurs when a company significantly beats earnings expectations. Analysts publish their earnings expectations for a company before quarterly earnings are announced. Earnings expectations from all of the analysts who are currently following a company are added together and averaged out, creating a "consensus earnings estimate". If the earnings number ends up being much higher than the consensus estimate, then this constitutes an "earnings blowout". Analysts expect, on average, that XYZ will post earnings of 43 cents per share for their upcoming quarter (Q4). XYZ ends up posting a number of 64 cents per share, easily besting even the most optimistic of estimates. This would certainly constitute an "earnings blowout".